The shelter with generator was set in place yesterday at our Burnside Township site. Workers and truck drivers had their work cut out for them with the warm and rainy weather. Lot’s of rain mixed with a 2 inch frost that recently melted made the newly landscaped site very muddy. The trucks with the crane counterweights and shelter were unable to back up the long service drive with their loads. 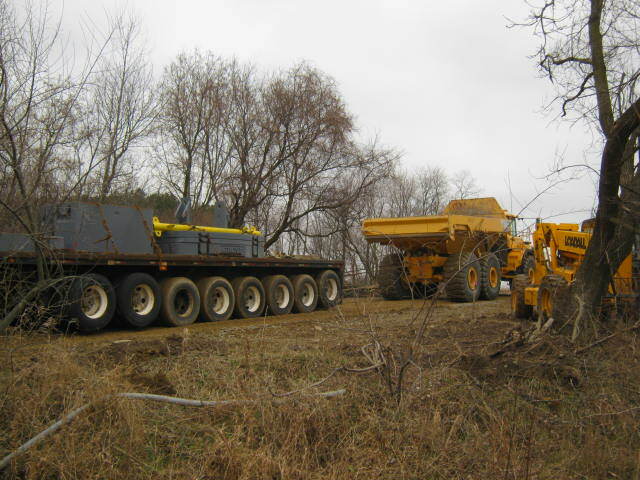 A giant dump truck from a nearby gravel pit was used to tow the trucks up the hill to the site. The truck with the shelter had a gross weight of over 100,000 pounds. By the end of the day, the shelter was in place and all the trucks made it out of the site and the service drive graded again.